This taekwondo uniform is made of a 7oz poly/cotton blend fabric which is light and breathable, allowing the new student, to "ease" his or her way into shape with out tiring too quickly, from having to battle his uniform AND his opponent at the same time. The pants feature elastic waist with a drawstring, which allow for easy adjustment to fit any and all sizes very comfortably. 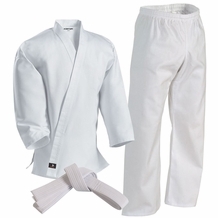 One uniform consists of a V-neck jacket with white lapel, a pair of pants, and a white belt. Sizes available from Kids size:000000 for 3 yr olds, on up. * Made from 7oz poly/cotton canvas. 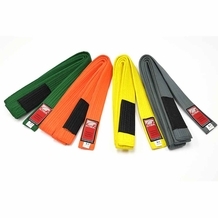 * Durable, lightweight, flexible and very comfortable. 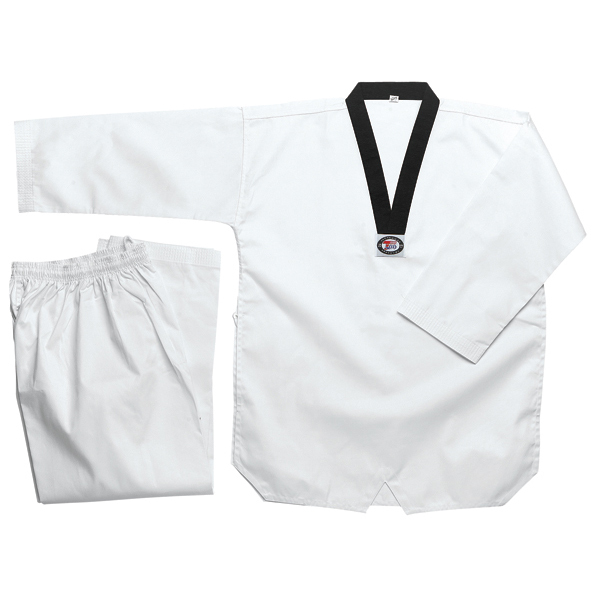 * The pants are designed with elastic waistbands that have drawstrings, which allow for easy adjustment to fit any and all sizes very comfortably. 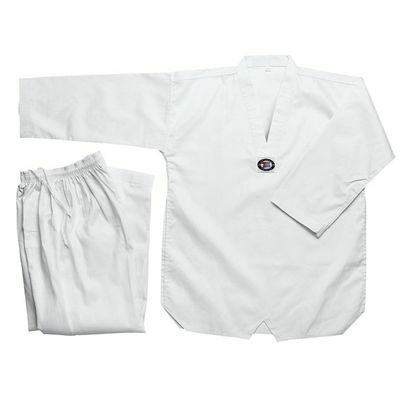 * One uniform consists of a V-neck jacket with white lapel, a pair of pants and a white belt. 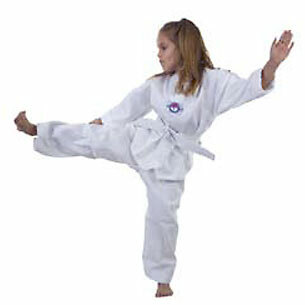 Student TKD uniform 5 Great product for the cost. I have several students that have had theirs for several years. Students grow out of the uniforms before they get ruined. so close to 5 stars! 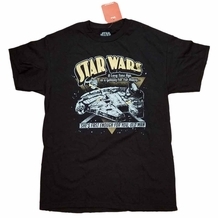 4 I gave this 4 stars only because the sizing was off/small. The quality was excellent. Service was excellent. But I am in the process of returning/exchanging because of the sizing issue.